We were engaged by a newly hired leader of a large privately held corporation. One of their subsidiaries had taken a dive. The market conditions had shifted. Poor executive hirings led to a fear-based culture and within a few years this division went from being a top performer to a drag on corporate cash flow. Given the lagging performance, the new leader was brought on board to “get it moving again”. He wanted to change the culture from within and take the organization in a new direction. He wanted the division to become more innovative and customer focused. He heard about our work – how we provided new views of an organization based on informal relationships. He wanted us to uncover the key, informal influencers that could help move the division forward. To do this, we surveyed the employees. One of the key questions we posed to the entire team was this: Who did employees perceive as customer-service role-models? Who consistently delivered superior service, regardless of their position in the organization? The answers are revealed in the Keyhubs map below. 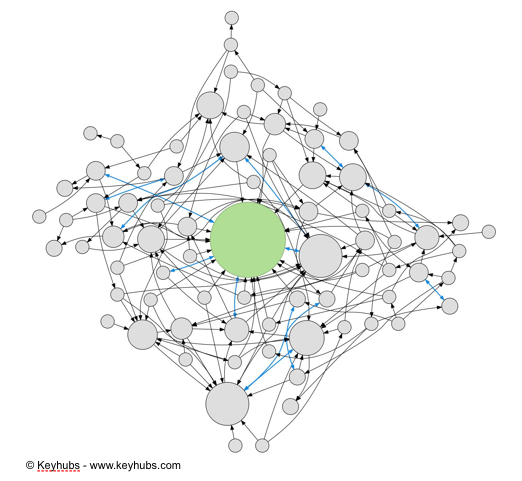 Each node represents an employee in the division. Their selections are represented by out-bound arrows. 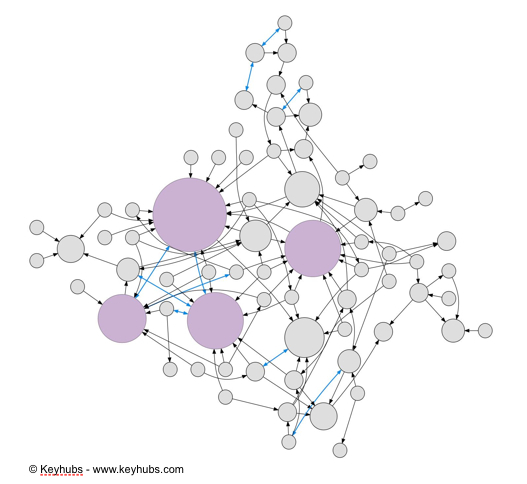 Employees with a high number of selections (in-bound connections) are larger in size (and influence) and tend to move towards the center of the network. One employee (in green) really stands out. She is perceived as a key customer-service hub in the organization by many of her co-workers. When we showed this to the leader (and HR), they immediately rattled off a couple names. After 7 or 8 tries, they gave up. They had no idea who she was. No wonder. When we overlaid the network on top of their formal hierarchy (below), you can see that she was buried in layers of management – 4 levels down! Out of sight, out of mind. Many employees like her are forgotten and overlooked everyday. Was she appreciated? Did she realize she was such a positive influence? What if she left the company? How could this employee be more effectively leveraged to help create a positive, customer-oriented work culture? While you ponder those questions, take a look at the map below. It stems from the question we posed around resistance: Who in the organization actively blocks the forward momentum of new initiatives? Four employees really stood out (in purple). Where were they in the hierarchy? Need we say more? Houston…we have a problem. These two divergent, but very real scenarios sum up the kind of organizational dysfunction that is common in many corporate environments. When you combine monetary incentives with hierarchy, selfish ambition and territorial dynamics, you are bound to get contorted cultures and systems that make progress very difficult. On one hand, it is difficult for leaders to see this kind of dysfunction at work. They may have a hunch, but their perceptions will be greatly skewed because of their position in the hierarchy. Mid-level managers and lower-level employees see it much more clearly; however, mustering up the courage to name or articulate it for leaders in an unbiased, authentic way can be very hard. With this kind of insight, our client took informed steps in the direction of progress. They reorganized with clarity and purpose. They designed strategies that got to the heart of the opportunity and the challenge. And, from what we’ve heard, this division is now on an upward trajectory. Not all leaders are ready for the “naked truth” about their organization. But the ones that are, undoubtedly come out with insights that surprise, enlighten and transform. Does this story resonate with some of your experiences in the business environment? How could a bottom-up view help your organization move ahead?